Our trip to Pagsanjan Falls via Cavinti was one of those last minute “call of nature” adventures. To my dismay, my February ended with no out-of-town trip while hubby had a short Cebu-trip mid-Feb. So as a relief, he treated me for a Pagsanjan Falls day tour. 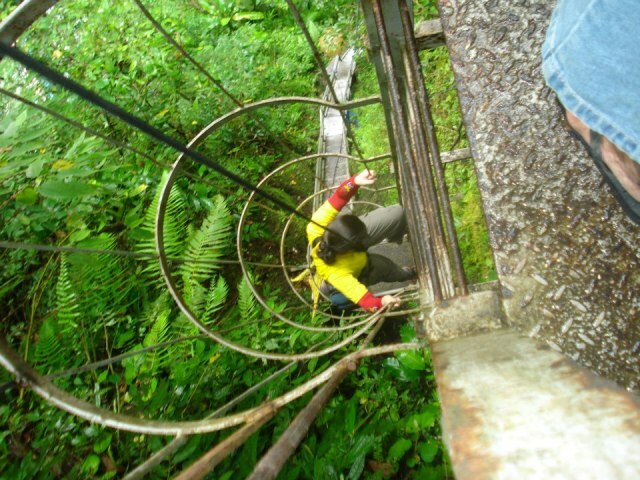 He said he read an article featuring a budget-friendly but adventurous way to reach Pagsanjan Falls. We left the Metro around 6am via Rizal-Laguna route. Unfortunately, the Pagsanjan Bridge was under construction and not passable to 4-wheel vehicles. Our option was either to take the other route which will take about one hour or the P2 Balanac River raft-cross then commute to Cavinti. We opted for the latter and we joked, “an adventure earlier than expected”. At the other side of the Balanac River, jeepneys bound to Lucban and Cavinti are lined-up waiting for passengers. We told the driver to drop us at the terminal for Pueblo el Salvador Nature’s Park and from there we took a tricycle for a P70 15-minute Pueblo ride. After paying the P270 registration fee and guide arrangement, we started our 1-hour trek to the falls. 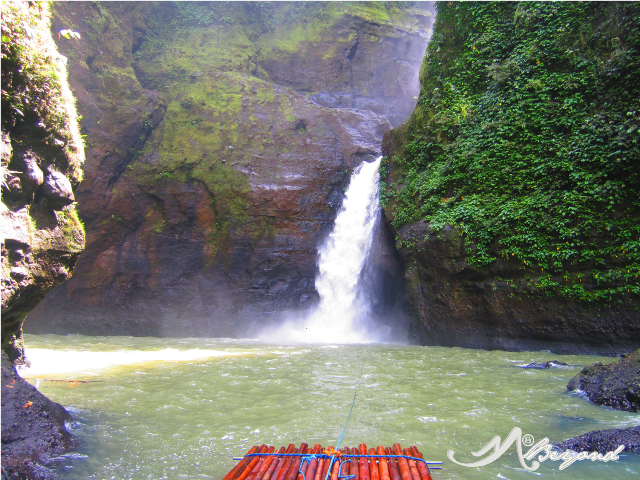 It is known as Magdapio Falls for the locals of Cavinti, named after the couple Magda and Pio. After the 15-min concrete-paved trek, we entered the forest. 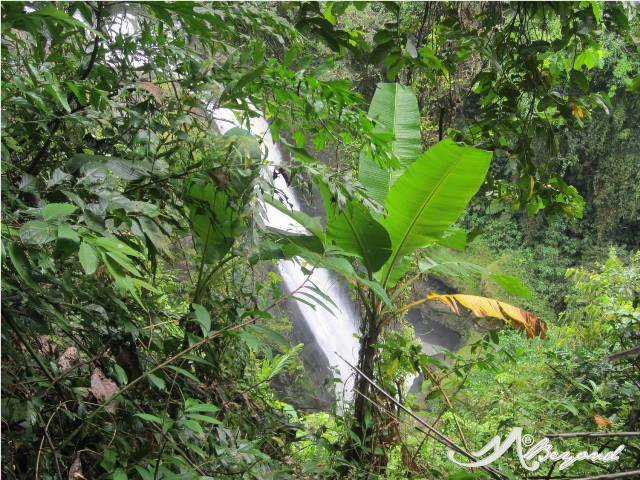 We had a glimpse of the first falls called Nakulo and the towering “unnamed” and “unreachable” second or the middle falls. It was just then that I learnt of Pagsanjan Falls upper levels. The middle falls will surely be another attraction but reaching it at this time remains a mystery. The steel ladder trek started at the statue of El Pueblo, it was there that we wore our harness in preparation for the vertical part. I was amazed by how they constructed the ladders. We passed numerous metal stairs and two vertically enclosed ladders. As we approach the falls, the stairs are getting steeper and steeper until finally.... drum rolls... not yet... the Pagsanjan River adorned with colorful boats welcomed us. 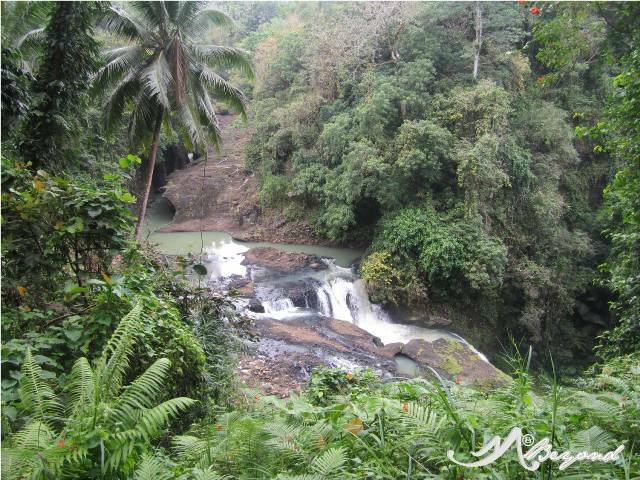 Then a short trek and hurrah... the beautiful Pagsanjan Falls. We were told by our guide Kuya U-tol to join the river rafting right away while tourists are still few. So without hesitation, we dared the breathtaking Pagsanjan Falls cross for the Devil’s Cave hidden behind. The “raft man” left us at the cave while he returned to fetch other tourists. I took the chance to enjoy the whirl-like current with hands firmly grasped at the rocks. Crowd was still lesser at 11am but minute after minute; the crowd grew to hundreds... mostly Korean-tourists via the Pagsanjan rapids. I noticed that they were not allowed to stay longer... Crossing the falls is the highlight of their adventure and as soon as they finished it, the boatmen rushed for their return trip. Well... I can say that longer stay and unlimited rafting is the advantage of the Cavinti-tourist plus the return ascend via the metal ladders, the highlight of the adventure. Speaking of ascending, we started our 1-1/2 hour clamber or should I say crawl, at around 12:30pm. Kuya U-tol also toured us to the viewpoint of the Nakulo Falls. He mentioned that during summer, it is another tourist destination where they offer short rafting trip by the narrow canyon. At 2pm, we’re on the road again for our trip back home... until next time. hi maja, for our visit, we went to Laguna by private transport but I believe you can reach it taking a bus bound to Sta. Cruz. Then from Sta. Cruz, take a jeepney to Cavinti or since bridgeworks are on going, you may ask the locals of the easiest way. Then ask the driver to drop you off in the tricycle terminal bound for Pueblo El Salvadore Nature Park. 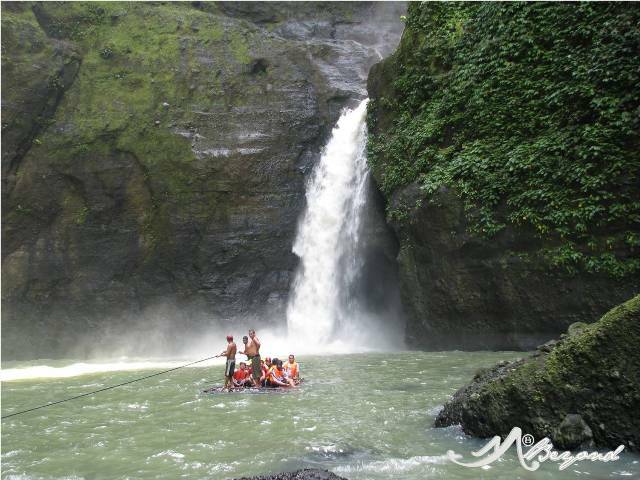 Behind the beauty of the Pagsanjan falls is the devil's cave, so watch out! can i have your permission to post this blog ? i have a fb page called Exploring Cavinti. no problem.. just don't forget to link to this blog.